GREEN FOR LIFE SMOOTHIE This revitalizing smoothie is perfect for an afternoon energy boost. TEA POPSICLES These simple frozen popsicles are quick and easy to make, and delightful to eat on a hot summer afternoon. RED AND GREEN KALE CHIPS Super crunchy and delicious, these tasty seasoned kale chips can easily replace less healthy snacks. EVERY CHILD’S FAVORITE Always a winner, this is one smoothie even picky eaters will enjoy to the last drop. GOLD AND WHITE PERSIMMON PUDDING Beautiful to behold and delicious to eat, this healthy dessert is the perfect treat for the holidays. TIS THE SMOOTHIE TO BE JOLLY This simple blend is sure to lift your spirits this holiday season with its healthy nutrients and yummy flavor. STRAWBERRY DAYDREAM Try this smoothie for a healthy dose of antioxidants, and a delicious refreshing dessert. KIWI GLADNESS Enjoy this smoothie with a side of fresh watermelon. MINTY SUN TEAThis sweet sun tea is cooling and refreshing to drink, its the perfect drink for a summer afternoon. GREEN PERFECTIONThis exceptional green smoothie is well suited for parties and special occasions. Its superb flavor is certain to make a splash. ALMOND VANILLA CREAM SMOOTHIE A tasty breakfast smoothie, this unique blend of fruit and almond milk yields a feeling of satiation for many hours. MELON CANDY SMOOTHIE This sweet smoothie tastes like candy, and has a soft, alluring fragrance. PARSLEY VANILLA PUDDING Creamy and delicious, this pudding is the perfect dessert to satisfy your sweet-tooth cravings. BLUEBERRY SWIRL POPSICLES Cool off with a delicious and healthy dessert, these popsicles are sure to make your stomach smile! FOUNTAIN OF YOUTH SMOOTHIE Try this recipe for a boost in energy and a soothing, flavorful blend of nourishing ingredients. RAINBOW SALAD This may well become your favorite new salad, with its fragrant herbs and crunchy veggies. SERGEI’S EMERALD GREENPLESAUCE This unique twist on applesauce will charm your taste buds and nourish your body at the same time. MEXICAN PAPAYA PUDDINGOne of the joys of summer desserts is papaya pudding. Easy to make, and absolutely delicious, the texture of this pudding is so fluffy it vanishes in your mouth like clouds! BLUEBERRY MINT SMOOTHIE This smoothie boasts big flavor, and cooling frozen yumminess. The mint adds a delightful burst of freshness. VALYA’S KALE CHIPS These crunchy green chips are easy to make and are a healthy alternative to store bought chips. BANANA MANGO ICE CREAM The perfect summer dessert, this ice cream is both filling and light. The Champion Juicer whips up the frozen bananas until they are creamy and delicious. TROPICAL PARADISE SMOOTHIE Get a taste of the tropics with this epic mix of delicious fruit. If sunshine had a flavor, it would taste like this smoothie! KIWI SPLASH POPSICLE Only minutes to prepare, these outstanding popsicles are perfect to have on a hot summer afternoon. SUMMER GAZPACHO This delightful gazpacho is satisfying and light, and very quick to make. This simple soup is sure to become a summer staple! PARSLEY ENCHANTMENT A fresh tasting smoothie, this green elixir has a pleasant aroma and an extra smooth texture. SELENIUM POPSICLES Each one of these yummy popsicles meets your daily needs for selenium. GREEN DIAMOND SMOOTHIE This zesty smoothie is pleasantly refreshing and satisfying. VALYA’S SILLY-YUM SORBETTry this satisfying dessert for a guilt-free afternoon treat. GREEN SMOOTHIE FOR BEGINNERSThis delicious green smoothie is always a winner, with its smooth texture and sweet flavor. ABOUT OUR COMPANY We are a family of writers, specializing in the field of nutrition. We are dedicated to providing readers with a wide range of quality information form sources that can be trusted. ABOUT THE BOUTENKOS After reversing their own numerous health ailments, Victoria, Sergei, and Valya Boutenko have become committed to sharing the healing power of good nutrition with the world. The Boutenko's write books, make films, and travel the globe to share their knowledge and experience. OUR ONLINE SHOP We have created this online shop to make our products available to everyone worldwide. Our physical store in Ashland Oregon USA is now closed. In an attempt to preserve trees and protect the environment, we have been publishing more and more of our books electronically as eBooks. Sign up for our weekly newsletter to stay up to date on our latest eBooks. Your idea of healthy food is about the change forever. Raw Vegan pioneer and chef Cara Brotman teamed together with health expert Markus Rothkranz to bring you the most exciting uncookbook imagined. You can still eat pizza, pasta, bacon, cheese, pop tarts and all the pies, cookies and cakes you want without sacrificing your health. In fact, as sinful as this food seems, it might actually make you feel better than you've ever felt in your life. This raw vegan uncookbook is revolutionary. Everything is made from uncooked plants, yet it looks and tastes exactly like macaroni and cheese, chocolate cake, Kung Pao chicken, Pasta Pommodoro. All made without meat, gluten, dairy, wheat, sugar or anything unnatural. None of it is cooked, the ingredients and simple and the recipes are easy. This is a new way of looking at healthy food. A new way of living. 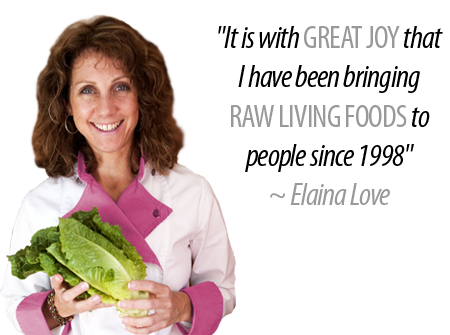 Pure Joy Planet is dedicated to helping people integrate raw living foods into their daily diet. Pure Joy Planet products, recipes, classes, retreats, workshops and services revolve around the simple concept that raw living foods are fundamental to personal health and a healthy planet. Vegan, vegetarian and nutrional diets create wellness, energy and clarity. Many more of her tantalizing creations can be found in Elaina's Pure Joy Kitchen recipe book. Ideal for anyone interested in preparing healthy, raw food meals, regardless of experience. Elaina's Pure Joy Kitchen presents wide variety of easy to follow, raw, vegan crowd-pleasing recipes that will impress both you and your guests!